My family has always been into games. Mostly card games. One in particular has yielded some of our best stories. The game is called Nertz. It is basically a real time group solitaire game being played inside a mosh pit. 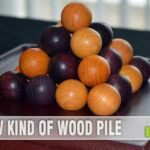 If you have ever had the pleasure to have played, or even just watched a game of Nertz, you will completely understand what I am talking about. It has players watching everyone else’s hand while frantically trying to get rid of their own cards before their sibling leaps across the table to take away a prime opportunity. My first impression of Beeeees! 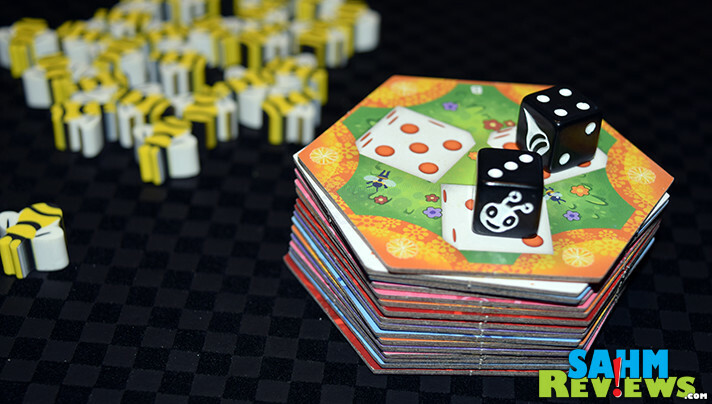 from Action Phase Games was that someone had packed the energy and fun my family had with Nertz into this tiny dice rolling game. I had a smile from ear to ear playing Beeeees! Like Nertz, Beeeees! is a real time game. It however, doesn’t use a deck of cards, but rather dice that you roll to try to find a place on various flowers to the left, right, or directly in front of you. You are trying to match the symbols on the flowers with the dice that you can continue to roll. Once the flower has been completely filled the person who did the most to complete it collects the flower, flips it over to reveal a honeycomb that will now be incorporated into their beehive. 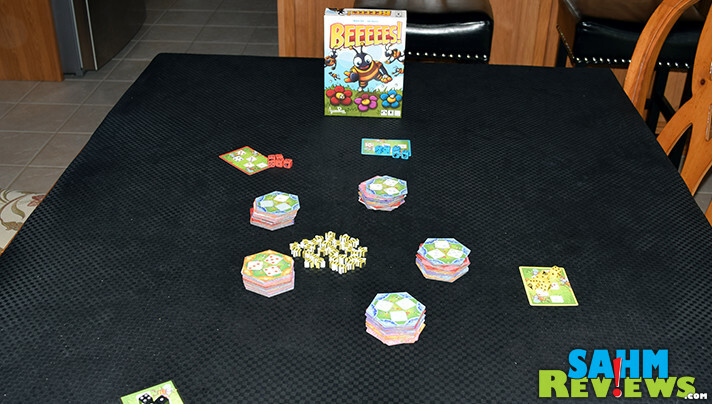 Each player is building their own beehive trying to match up colors to produce greater points at the end of the game. Simple enough right? What if I was to tell you that the player to your left and right are doing the same thing? 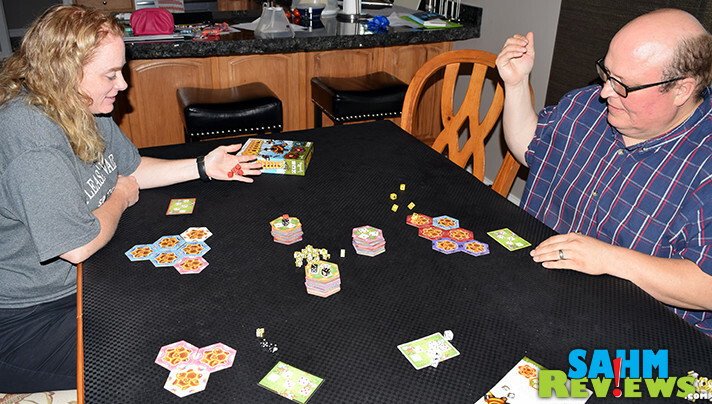 So while you are looking to match up your dice that you had just rolled, Johnny to your left is rolling furiously trying to steal that same flower out from under you. While Timmy to your right, is working just as hard to take the flower right in front of you. That one you thought you had in the bag. At this point the game is frantic and just mean enough to be completely enjoyable. There are also special wildflowers that cause the person who revealed it to shout “BEELINE!”. This leads to a race with those close enough to participate to grab these most valuable tiles. This all leads up to five people rolling dice like lunatics in order to beat those around them to the finish line. Which, if you came from my family, sounds like a great Sunday afternoon. The energy at the table while playing Beeeees! is the right amount of craziness mixed with the occasional disappointment as someone steals that tile you needed so badly. It all happens so fast that it is hard to hold a grudge. You just have to go out there and steal that next one away from them before you get left behind. You can’t get caught up in grudges or you will have no time to think about how you need to get to that next one before Johnny, or Timmy do. The game is not all about speed. While taking the tiles there is a fair amount of thought that needs to go into placement. 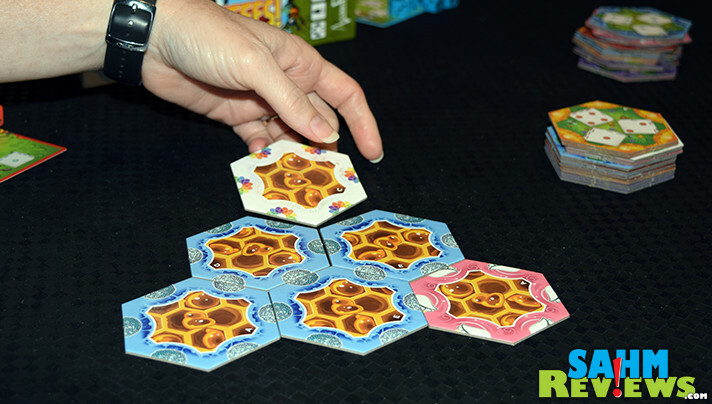 The end game scoring mostly comes down to your success in matching up the colors of your honeycomb tiles. This thought will reward you over those that are just out to collect everything they can get their hands on. The components are solid for the game. 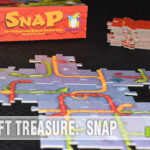 The dice and tiles are exactly what you need for this kind of game. Durable enough to handle the wear and tear you are going to put them through. 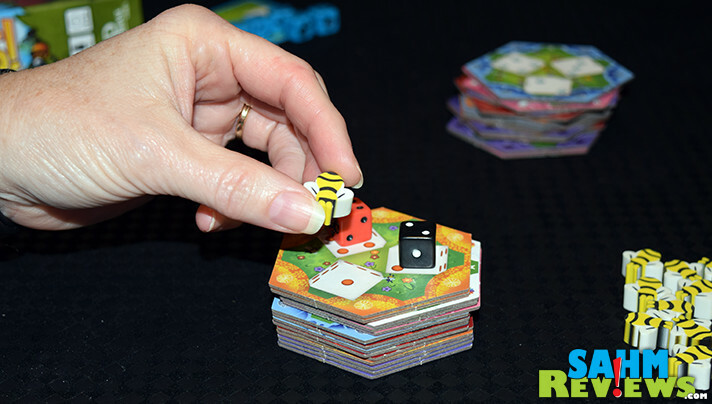 The helper Bees that come in the game and are used to provide a salve for those players shut out on a dice that they helped build are made from an eraser like material that I found to be a nice addition to the game. Beeeees! was a great deal of fun to get to the table and thoroughly enjoyed by all that participated. But for me it really called back those memories of sitting around the kitchen with all my brothers and sisters and cousins racing to be the first to be out of cards. I have fond memories of the fun we had in those days, and it looks like I will be able to look forward to the memories my family and friends will make while playing Beeeees! 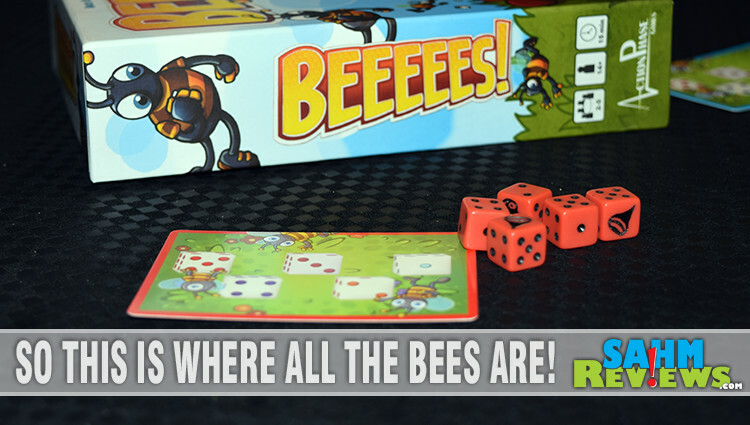 If dice games get you buzzing, then you can pick up a copy of Beeeees! on Amazon, make some honey-infused deviled eggs and have a sweet game night! 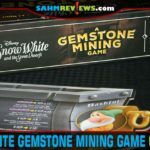 If you follow them on Facebook and Twitter then you already heard the buzz about their connection to Stronghold Games. Learn more about them and their upcoming games through their social channels, but also be sure to check out their website as well. I would play with my gaming group. My son would probably win! friends & family, well, I would try to win. lol. I think this would be a fun game to play with friends on a Friday night. I would play with my family and I am not sure if I’d win, haha. I would play Beeeees with my nephew and probably lose most of the time. I would play with my friend Mary and I don’t know if I would win or not. She’s a pretty good game players. Would game with local board games Club and Nathan would probably win. I would play this with my grandson and I would make sure he would win. I would play with my family and friends! Of course, I would try to win! I would play with my son and husband. My son would probably win. I’d play with my wife. She’s scared of bees, so I’d win…. My wife, and no… she’s the luckiest dice roller ever. I would play with my mom and my niece and would probably lose. I would play with my grandson!! I sure hope I win but don’t know for sure!! Not sure who would win, we are evenly matched. I would play with my children and they would probably win! I would play the game with my two grandsons on the weekends.